Home Blog Polish HTML5 game developers educate and grow awareness of the market. Some of our readers may not be aware that we have many talented HTML5 game developers here in Poland. This was seen when we experienced a great amount of interest from developers from around the world during the onGameStart conference in Warsaw. At the conference, we met a large number of developers who are doing their best to create their first games and learn about HTML5 game coding and the business side of game development. Unfortunately the Polish HTML5 gaming market is not yet aware of the true potential of web based gaming (especially for mobile). On the other hand, we see a growth in the number of polish developers who find this niche not only challenging but also potentially profitable. Despite our gaming market’s lack of support for web solutions, we do our best to show our products globally. Presently, we can provide examples of developers who release their games with major distributors around the globe. Our company Bushido Games, and our friends from Black Moon Design and Enclave Games have already proven that HTML5 gaming is working and can be profitable. I’m sure that other Polish developers have also tried their best to show on major HTML5 gaming sites. This is great, because it shows that not only it is happening in our country, but it is a fact. HTML5 gaming worked out in other countries, and it may also have a chance to do that in Poland. The only problem of course is the lack of support from huge companies/publishers to help developers unleach their web gaming potential. The lack of knowledge and promotion of HTML5 gaming also isn’t very helpful for the market itself. If the market would like to reach another level, it should look out for new solutions because right now the app stores aren’t working as well as they used to. Thanks to initiatives like the onGameStart conference, our dev friends also want to do something more for other developers. After reading his blog entry, I had a recent chance to chat with Andrzej Mazur. Unfortunately the blog is in the Polish language, so it may be a bit of problem for many foreign readers. The article (CLICK HERE) promotes Workshops for developers, which are an idea of Andrzej Mazurs’s friend, Piotr Zwoliński. The workshops are planned to start in May or June, 2014 in select Polish cities depending on the number of people attending. If those workshops happen then Andrzej Mazur will be hosting them. 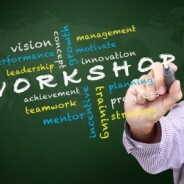 (There may be about 6 workshop events.) Those events will also contain devmeetings and Phaser meetings. This sounds like a great opportunity for inexperienced game devs! This way, developers can not only learn more about HTML5 game coding, they can also find out what the future is for web gaming. It will also be possible to find out what the technology is like and how a developer can start his adventure in this still young gaming niche. If you feel interested in this event, go to THIS SITE and fill in the form. The more interest, the bigger the chance for workshops to be successful and the more likely the workshops will be held in more locations. There are also opportunities to take part in similar events. If you are interested, please go to the gamedevjs.com website. You will find more information about upcoming workshops, hackathons and meet ups at that website. Sounds great, doesn’t it? I really would like to see more of this happening in the Polish gaming market. Workshop events are not only a great place to learn about coding, but the promotion of similar events can bring a higher interest to the Polish gaming market and bring big companies into web gaming (especially mobile). If you like the idea – support it and join the workshop! Interesting how it’s changing. From my experience, just after we released our HTML5/Canvas shooting game (play here: http://www.merixstudio.com/skytte/) we’ve been flooded by new enquires and potential leads. Foreign market is ready for commercial html5 game development, Polish one – not yet, but it’s a matter of weeks/months I believe. We do our best to educate clients and everything is heading in right direction!